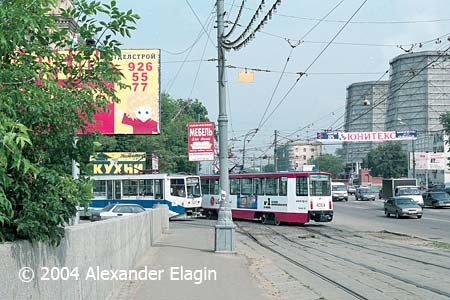 This terminus is located in the eastern part of the central Moscow, not far from Aviamotornaya metro station. 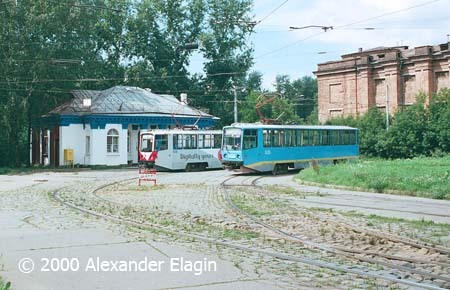 The first line of electric trams started service here in 1925. This district has long years of industrial history that began in 1869 when a Prussian businessman Dangauer established his fitting shop here. Later on, his small enterprise has grown to a large machinery plant, since 1931 under the name Compressor. This plant for many years has been one of the national leading manufacturers of industrial refrigerating machinery and chemical equipment. A line to the terminus branches from the trunk line along Shosse Entuziastov just after an overpass across a railway line. The southern side of the road is occupied by a large industrial district. The terminus resembles a stretched two-tracks loop connected with the main line via this curved section of tracks. A few years ago one could still see the old wildstone pavement around the rails - like I managed to catch on this pretty old photo - but now it is gone. Standard concrete slabs and asphalt have replaced the old pavement almost everywhere. 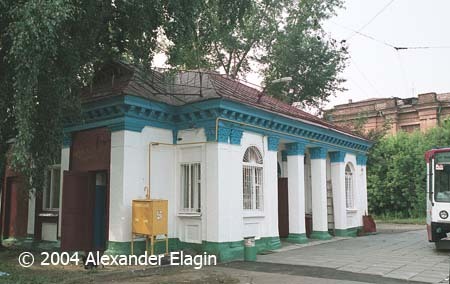 The old tram station pavilion is one of the few still remaining such buildings constructed in 1944-45. 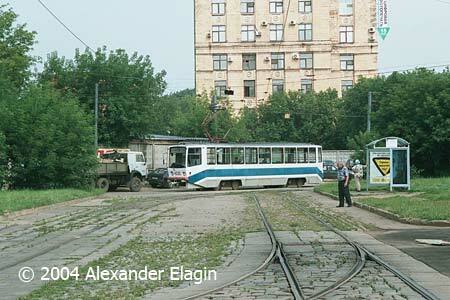 It obviously deserves to be named a historic monument, but I doubt whether it could ever happen.. The last remaining area of wildstone pavement is located at the exit from the reversing loop - not for a long time, I suspect. 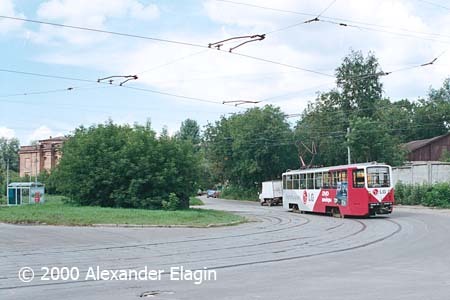 A trolleybus terminus is also located nearby; it is used by trolleybuses running hence to the eastern districts of Moscow. 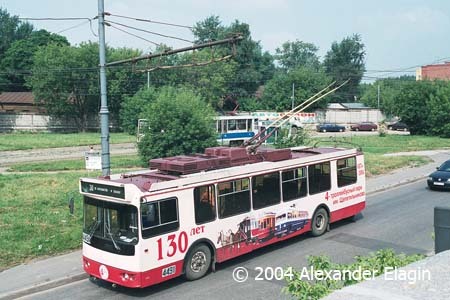 The trolleybus on this photo is noticeable for its livery devoted to the 130th anniversary of the trolleybus depot #4 that for many years hosted trams - horse-drawn and electric, since 1874 until 1957.